Aerial view of the Wintrust Arena rooftop at Chicago’s McCormick Square, 200 E. Cermak Road. The multi-purpose event center opened in the fall of 2017 and is home to the DePaul University Blue Demons men’s and women’s basketball teams and the Chicago Sky. The rooftop, sporting an image of the Chicago flag, was photographed during a Nov. 28, 2017, flyover. 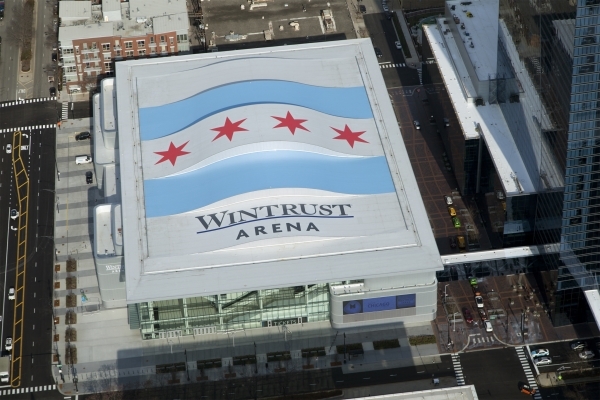 Wintrust Arena at Chicago’s McCormick Square is sporting what likely is the largest rooftop image of the Chicago flag anywhere in the world. Measuring 196 feet by 236 feet, installation of the flag image on the event center’s roof was completed in late November. It is displayed above the Wintrust Arena logo, which measures 48 feet by 146 feet. Each of the four, iconic six-pointed red stars on the historical Chicago flag image is 50 feet in diameter — about half the size of the DePaul University Blue Demons basketball court under the roof. “What better image than the Chicago flag to show that DePaul basketball is proud to be back in its hometown. We developed the concept jointly with Wintrust Financial and quickly had the blessing of our architects, Moody Nolan and Pelli Clerk Pelli,” said DePaul President A. Gabriel Esteban, Ph.D.
“We are honored to display the Chicago flag image and Wintrust logo on the roof of our new home in Chicago’s vibrant South Loop neighborhood,” Esteban noted. 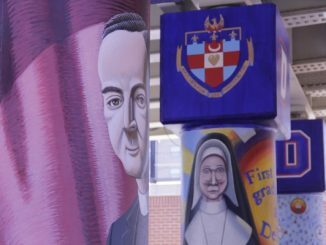 The sponsorship between DePaul and Wintrust Financial Corporation was announced more than a year ago, on Nov. 16, 2016, when the arena was still under construction. The Wintrust Arena opened in the fall of 2017 and is home to the DePaul Blue Demons men’s and women’s basketball teams and the Chicago Sky. Designed as a multi-purpose event center, Wintrust Arena has already hosted a number of concerts with performers ranging from Chance the Rapper, Gloria Estefan, Bob Dylan, Mavis Staples, Common, and Erykah Badu. Fabrication of the flag image and Wintrust Arena logo took four weeks, with almost another three weeks to apply the pieces to the roof. Even with Chicago’s frigid winters and humid summers, the roof treatment is expected to last more than 15 years.